Port-au-Spain is the capital and third largest city of the island nation Trinidad and Tobago in the southwestern West Indies and north of the South American nation of Venezuela. The city, which is only about 5 square miles, had a population of 37,074 people in 2011 but its surrounding metropolitan area had 269,923 people in a nation of 1.3 million people. Like the country as a whole, Trinidadians of Indian descent are the largest ethnic group at 38% of the city’s population. Afro-Trinidadians are the second largest group at 36%. Mixed race people comprise another 24%. Europeans, Chinese, Syrians, and Lebanese, among other groups, make up the remainder of the population (2%). Port-au-Spain is located in the northwest of Trinidad on the Gulf of Paria and is 11 miles away from the country’s largest city, Chaguanas. 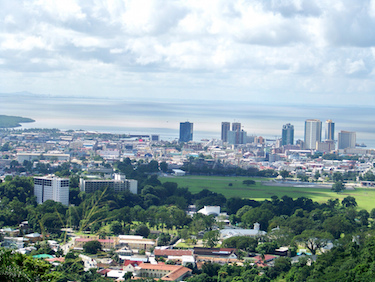 Although tourism is an important part of the Port-au-Spain economy, it also produces beer, cigarettes, margarine, oils, and building materials and has citrus canneries, sawmills, and textile factories. The city’s port, a major center of trade in the West Indies, is 15 miles east of the city and Trinidad’s chief airport is located in the suburb of Piarco. The history of Port-au-Spain began in 1560 when the Spanish built a small mud walled fort to protect a settlement they had founded on an Amerindian fishing village called Cumucarpo. The settlement in 1757 became the administrative center of the island, replacing San Jose de Oruna. By 1783 Port-au-Spain was a prosperous city with a population of 3,000 making it one of the largest urban settlements in the Caribbean. The British conquered the island of Trinidad in 1797 and Sir Thomas Picton became the new governor. During his time as governor Picton helped to expand the amount of livable area in Port-au-Spain. From 1958 to 1962 Port-au-Spain was the capital of the short-lived Federation of the West Indies, an attempt by Trinidad, Tobago, Barbados, Jamaica, and smaller British Caribbean colonies to form a single independent nation upon independence from Great Britain. When the federation concept failed, the nations obtained their freedom independently of each other. In 1962, for example, Trinidad and Tobago gained its independence from the British. In July of 1990 a Muslim terrorist group held the Trinidadian prime minister and some members of parliament hostage for five days and also led to rioting by political opponents of the national administration. The hostages were freed when troops loyal to the government defeated the terrorists. Since 2005 Port-au-Spain has been the seat of the Caribbean Court of Justice. The landmarks and sights around the city reflect its cultural heritage and history. The national Parliament meets at the iconic building in the center of the city named the Red House. The Rosary Church within the town displays gothic architecture unusual for the Caribbean. Queen’s Park Savannah is the city’s largest open space and is a popular destination for recreation. The city also has the National Academy of Performing Arts, the National Museum and Art Gallery, and the Royal Botanic Gardens where the President’s House stands. Gerard A. Besson, "Port-of-Spain's Early City Life," The Caribbean History Archives, http://caribbeanhistoryarchives.blogspot.com/2011/08/port-of-spains-early-city-life.html; Roman A. Cybriwsky, "Port-of-Spain," Capital Cities around the World: An Encyclopedia of Geography, History, and Culture (Santa Barbara, CA: ABC-CLIO, 2013); "Port of Spain," Encyclopedia Britannica Online, http://www.britannica.com/EBchecked/topic/470934/Port-of-Spain.